Mochi ice cream is one of the most fun, delicious ways that you can consume ice cream. Because of this, you want to find some fun ways that you can serve up your mochi to enhance the experience even further. 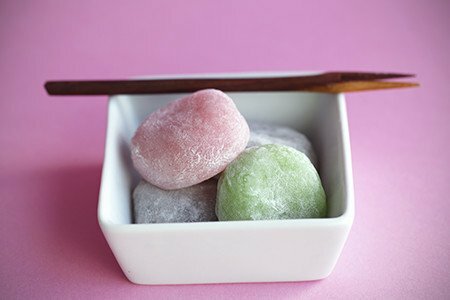 Luckily, many people across the world have come up with their own favorite ways of serving mochi, so using those, or coming up with your own is easy. Want to know some of the most delicious ways that you can serve up your mochi ice cream for the most flavorful experience possible? Here are a few ways that you can get the job done. If you want to get really creative with your mochi, serving it with some hot fudge syrup and some cut strawberries is a great way that you can do it. The great things about this is that the mochi ice cream is protected from the chocolate syrup, so you get the chocolate syrup, the dough, the ice cream, and the strawberries, all as distinct flavors. Want to find a fun way that you can take your mochi ice cream to the next level? Look no further than a martini glass, with some chocolate syrup, and some strawberry slices on top. If you want to serve them on a platter at a party, just as bites, it’s a good idea to cut them into halves. This is mostly because the size of a mochi ball is too big for a single bite, and you want for your party snacks to be served with variety, and with multiple bites. These are some of the easiest ways that you can make sure that you’re mochi is conveniently consumable in the face of company. Cut them into halves if you want to make your mochi as easy to eat as possible. If you really want to have fun with it, there are plenty of syrups that produce a hard shell candy coating after they’ve sat for a bit. These are great for mochi, because not only do you get the sweet mochi dough and the premium mochi ice cream, but you also get the candy coating on the outside, making the taste of the dish even more sweet and flavorful. These come in many different varieties, so whether it’s caramel, butterscotch, or chocolate, there are plenty of ways that you can improve your mochi ice cream experience. Your experience with mochi ice cream should be an experience, and although eating mochi is an experience in and of itself, there are definitely ways to make it even better. If you want to try this out, cut them into halves for company, coat them with a syrup that turns into a hardshell, or serve them up fancy style in a martini glass. Any of these are great ways that you can make dessert time great again.